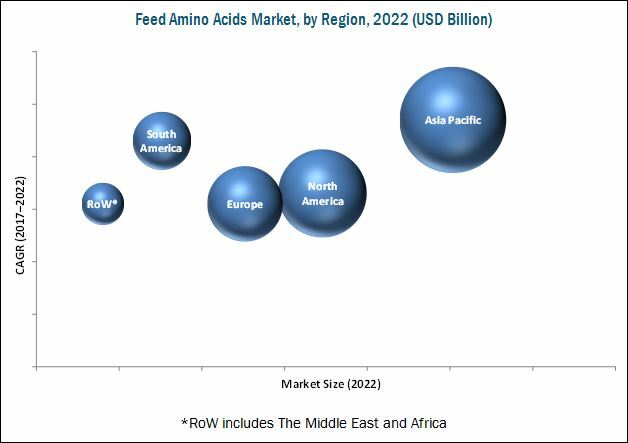 [161 Pages Report] The feed amino acids market was valued at USD 5.18 Billion in 2016. It is projected to grow at a CAGR of 4.4% from 2017, to reach USD 6.66 Billion by 2022. The base year considered for the study is 2016 and the forecast period is from 2017 to 2022. The basic objectives of the report are to define, segment, and project the global market size for feed amino acids on the basis of type, livestock, form, and region. It also helps to understand the structure of the feed amino acids market by identifying its various subsegments. Other objectives are analyzing the opportunities in the market for stakeholders, providing a competitive landscape of market trends, and analyzing the macro and micro indicators of this market to provide factor analysis and to project the size of the feed amino acids market and its submarkets, in terms of value and volume. This report includes estimations of market sizes for value (USD million) and volume (KT). 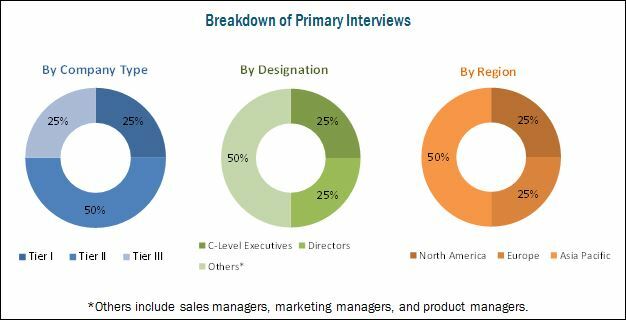 Both, top-down and bottom-up approaches have been used to estimate and validate the size of the global feed amino acids market and to estimate the size of various other dependent submarkets in the overall market. The key players in the market have been identified through secondary research, some of the sources are press releases, paid databases such as Factiva and Bloomberg, annual reports, and financial journals; their market share in respective regions has also been determined through primary and secondary research. All percentage shares, splits, and breakdowns have been determined using secondary sources and verified through primary sources. The figure below shows the breakdown of profiles of industry experts that participated in the primary discussions. The feed amino acids supply chain includes companies such as ADM (US), Sumitomo (Japan), Evonik (Germany), CJ CheilJedang (South Korea), Ajinomoto Co., Inc. (Tokyo), Adisseo (China), Phibro (US), Meihua Holdings (China), Kemin (US), Novus (US), Global Bio-Chem (Hong Kong), and Sunrise Nutrachem (China). The feed amino acids supplied by these companies are used in feed products that are served to various livestock types such as ruminants, swine, poultry, pets, equine, and aquatic animals. The feed amino acids market is estimated to be valued at USD 5.37 Billion in 2017. It is projected to grow at a CAGR of 4.4% from 2017, to reach a projected value of USD 6.66 Billion by 2022. Feed amino acid products have become prominent in the recent years, owing to the growing awareness among the consumers regarding the impact of quality feed provided to the livestock on animal-based products such as meat and dairy products. Also, the inclination of livestock producers toward quality and nutritious feed products is fueling the demand for feed amino acids, as they help increase the feed intake and enhance the growth performance of livestock. The lysine segment, on the basis of type, is estimated to dominate the feed amino acids market in 2017. Lysine is an essential part of animal feed. The usage of lysine acts as a lower cost alternative source when compared to protein sources such as corn and soy, while maintaining high growth rates in the livestock, and reducing the pollution from nitrogen excretion. The poultry segment, on the basis of livestock, is estimated to dominate the feed amino acids market, by livestock in 2017. Growth in concerns about animal health and rise in awareness about the benefits of amino acids in feedstuffs have led to an exponential growth of the poultry feed amino acids market. The dry feed amino acids segment, on the basis of form, is estimated to dominate the market in 2017. Several advantages offered by the dry form of feed amino acids such as ease of storage & handling, cost advantage over liquid form, and protection from processing heat are expected to drive this segment in the coming years. Asia Pacific is projected to be the fastest-growing market during the forecast period, due to the continuous modernization of animal production techniques and the growing awareness among the consumers regarding the impact of quality feed provided to the livestock on animal-based products such as meat and dairy products. However, conventional methods of feeding animals such as forages, crop residue, and open grazing may restrict the growth of the commercial animal feed industry, and subsequently restrain the growth of the feed amino acids market in this region. The other restraints of the feed amino acids market include alternative protein sources and stringent regulatory framework. Companies such as ADM (US), Sumitomo (Japan), Evonik (Germany), CJ CheilJedang (South Korea), Ajinomoto Co., Inc. (Tokyo), and Adisseo (China) are the major manufacturers in the feed amino acids market. Apart from these companies, Phibro (US), Meihua Holdings (China), Kemin (US), Novus (US), Global Bio-Chem (Hong Kong), and Sunrise Nutrachem (China) are some of the major feed amino acid market participants who have a robust product portfolio in terms of feed amino acid products. *Details on Business Overview, Products Offered, Key Insights, Recent Developments, SWOT Analysis, MnM View Might Not Be Captured in Case of Unlisted Companies.